ULTRA-PORTABLE DESIGN - Small drone with ultra slim controller, the X20 is designed to be compact and portable without an overly large joystick. This mini RC drone is built with smooth designs to slip right into your pockets or small travel bags and makes a great gift for children. AUTO HOVERING AND HEADLESS MODE - Auto hovering is an altitude holding technology that lets the remote control drone stabilize and suspend in mid-air automatically, even when you let go of the controls. Altitude hold makes it more stable and suitable for kids or beginners. With the headless mode, you can fly this remote control drone and ignore the direction. Once the fuselage direction cannot be recognized, it can enter headless mode to continue flight. BEGINNER FRIENDLY DRONE FOR KIDS - The X20 is packed with a set of beginner-friendly flying features that makes it easy to use and maneuver. One button touch for easy take-off and landing. Headless mode makes it easy to pilot based on the drone's take off orientation. STANDARD MICRO-USB CHARGING PORT - Built-in Micro USB charging port makes charging your X20 drone as easy and convenient as charging your smartphone. You will no longer need to worry about losing the specific charger or charging cable for your drone. You can also charge your mini quadcopter drone via the computer with a Micro USB to USB cable. 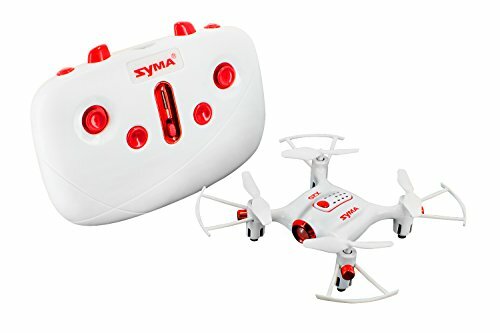 A GREAT INDOOR DRONE - As long as the indoor environment permits, children can enjoy the fun of drones without worrying about weather conditions outdoors. The small size makes it the perfect indoor drone; easily maneuver around small tight spaces.